In Uttar Pradesh, train No.14266 Dehradun-Varanasi Express running from Dehradun to Varanasi met with an accident at Bachharwan station near Ra Bareli in the Lucknow-Rae Bareli section of Lucknow Division of Northern Railways at around 9.10 AM today. While this train was entering Bachharwan station, the loco pilot of the train overshot the signal and entered into the sand hump, causing derailment of train engine and two coaches. There is a confirmation of eight deaths so far in the accident and around 30 persons have been injured. Injured passengers have been admitted to nearby hospitals. The accident site is about 30 kilometres from Rae Bareli. The Division Railway Manager of Lucknow Division along with branch officer and doctors proceeded for the accident site immediately after the accident to ensure speedy rescue and relief operation.. Accident Relief Medical train and Accident Relief Train were immediately rushed to the accident site. The Minister of Railways Shri Suresh Prabhakar Prabhu, who is attending to his Parliamentary duties is constantly monitoring the situation personally and directed Chairman, Railway Board, Shri A.K.Mital, and concerned Member Railway Board and General Manager Northern Railway to rush to the accident site. He also directed the railway administration to effectively undertake rescue and relief operations and provide best medical care and all assistance to the injured. The Minister of State for Railways Shri Manoj Sinha is also visiting the accident site. 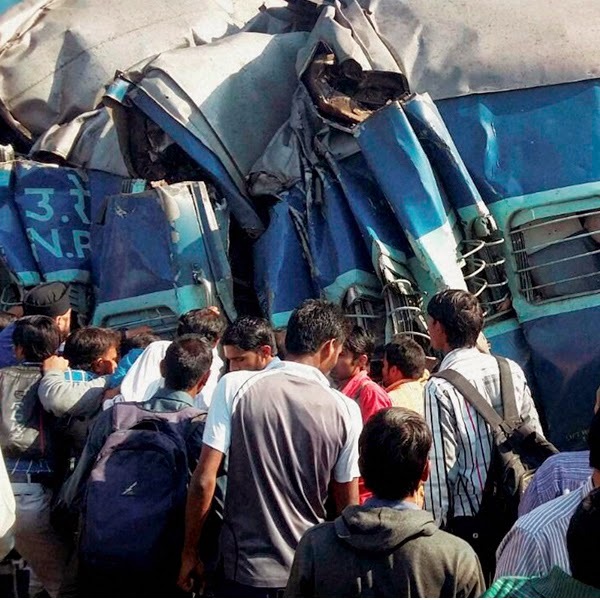 Shri Suresh Prabhu has expressed his profound grief over the loss of innocent lives. He has announced an ex-gratia of Rs. 2/- lakh to the next kin of the dead, Rs. 50,000/- each to grievously injured passengers and Rs. 20,000 to those who sustained simple injuries. The Railway Minister Shri Suresh Prabhu is constantly in touch with the railway officials and local railway administration. Helpline numbers are - at site Bachhravan-09794845621, Dehradun-0135-2624002, Lucknow-09794830973, Varanasi-9542-2503814, Pratapgarh-0534-2223830, Rae Bareli-0535-2211224, Haridwar-0134-226477, 226479, Barelly-0581-2558161, 2558162 for information and assistance. An inquiry has been ordered by Railways under Commissioner Railway Safety, Northern Circle, to ascertain the cause of the accident. Railway projects have, for long, suffered from financial crunch. A number of new initiatives have been announced in Railway Budget 2015-16. This includes formation of Special Purpose Vehicle (SPV) with equity participation by State Government & Railways, generation of resources through market borrowings i.e. low cost long term funds from insurance & pension funds, multilateral & bilateral agencies etc. for remunerative capacity enhancement projects, setting up of infrastructure funds, partnership with Railway PSUs, introduction of EPC (Engineering Procurement & Construction) system of contracting etc. Presently there is no proposal to involve funds from Member of Parliament Local Area Development Scheme (MPLADS) and Corporate Social Responsibility (CSR) fund in completion of Railway Projects. But it is proposed to tap these funds for passenger amenities & facilities at Railway Stations. Railways have taken up 132 New Line projects on socio-economic considerations at a total cost of Rs.1,47,553 crore for development of backward, remote, far-flung and naxalite affected areas. Based on demands raised by State Governments, Central Ministries, Members of Parliament, other public representatives & Railway’s own requirement, the proposals for new line projects are considered. Projects are taken up on the basis of their remunerativeness, last mile connectivity, missing links and alternate routes, augmentation of congested/saturated lines, socio-economic considerations etc. depending upon throwforward of ongoing projects, overall availability of funds and competing demands which also covers projects in naxal-infested areas. The projects are, however, not sanctioned State-wise, area-wise and region-wise. There are 154 New Line, 42 Gauge Conversion, 166 Doubling and 54 Railway Electrification projects across the country with throwforward of Rs. 2,85,652 crore. For Railway Electrification projects, the throwforward as on 1st April 2014 has been estimated to be Rs. 6,692 crore. Ministry of Railways has approached all State Governments to form Special Purpose Vehicles (SPV) jointly with Ministry of Railways to undertake mutually identified rail infrastructure projects for project development, resources mobilization and monitoring. Seventeen State Governments have consented to form the SPVs. To reduce delays on account of land acquisition, security issues and forestry clearances etc, meetings are held with State Officials at various levels and different Ministries of Central Government from time to time. BRICS nations have endorsed India´s Young Scientists Forum Initiative and this will form part of the BRICS STI work plan for the period 2015 to 2018. Expressing happiness at this, the Union Minister for Science & Technology and Earth Sciences Dr. Harsh Vardhan told the meeting of Science & Technology Ministers of Brazil, Russia, India, China and South Africa (BRICS) in Brazil that the Prime Minister Shri Narendra Modi had declared India´s strong commitment to the strengthening of cooperation within BRICS in this key sphere of Science, Technology & Innovation (STI) which directly impacts the welfare and progress of all our peoples. The Indian delegation led by Dr. Harsh Vardhan at the second BRICS Science Technology Innovation Ministerial Meeting, held at Brasilia this week, also proposed establishment of a BRICS Technology Foresight for Climate System to address scientific and innovative solutions for climate change and natural disaster management while identifying viable R&D initiatives for the future. The Minister said the institutional framework established in the form of a BRICS Memorandum of Understanding for Science, Technology, and Innovation at the meeting will act as an enabling vehicle to take our cooperation forward. Earlier he apprised delegates attending the meeting about various measures being taken by the Indian government for development of skills among its large youth population. He informed them about various steps for the promotion of innovation through allocations made in the this year’s annual budget for the Atal Innovation Mission (AIM), named after the previous Prime Minister of India Shri Atal Bihar Vajpayee. He said, the AIM will be an Innovation Promotion Platform involving academics, entrepreneurs, and researchers and draw upon national and international experiences to foster a culture of innovation, R&D and scientific research in India. Dr. Harsh Vardhan said the Science, Technology and Innovation (STI) have emerged as the major drivers of national development globally and India now aspiring for faster, sustainable and inclusive growth, with the advantages of a large demographic dividend and the huge talent pool is expected to use the STI system to the utmost extent to play a defining role in achieving its national goals. The national STI enterprise is central to national development. A strong and viable Science, Research and Innovation System for High Technology-led path for India (SRISHTI) is the goal of India’s new STI policy, he asserted. Union Minister of State for Water Resources, River Development and Ganga Rejuvenation Prof. Sanwar Lal Jat has said that effectively managing the available water resources to meet growing demand is a big challenge. Releasing the United Nations World Water Development Report-2015 titled “Water for a Sustainable World” here today the Minister said “Water is sacred and worshipped as God in Indian civilization. The National Water Policy adopts an integrated approach to water management which is vital for poverty reduction, environmental sustenance and sustainable economic development.” He said reviving the environmental health of one of the country’s largest and most important river, the Ganga is an important priority for the country since 45 percent of the country’s population depends on this river for livelihood and well-being. Mr. Michel Jarraud, Chairperson of UN-Water and Secretary-General of the World Meteorological Organisation said that water and sanitation are essential to the achievement of many sustainable development goals. They are inextricably linked to climate change, agriculture, food security, health, energy, equality, gender and education. In 2000 India had nearly 19 million mechanised or tube wells, compared to less than a million in 1960. This technological revolution has played an important role in the country’s efforts to combat poverty, but the ensuing development of irrigation has, in turn, resulted in significant water stress in some regions of the country, such as Maharashtra and Rajasthan. This example alone illustrates the complex relationships between access to water and development. While water is essential for economic growth and the fight against poverty, it is also itself directly affected by economic development. To find a solution to this conundrum, we must seek a balance between water supply and demand. The United Nations World Water Development Report is the result of collaboration between the 31 agencies of the United Nations system and the 37 international partners that make up UN-Water. It is produced by the World Water Assessment Programme (WWAP), hosted by UNESCO. The report presents an exhaustive account of the state of the world’s water resources and, up until 2012, was published every three years. Since 2014 it has become an annual publication, devoted to a specific theme. Its publication is now timed to coincide with World Water Day, whose theme is also aligned with that of the report. The Report is published by the World Water Assessment Programme, which is hosted by UNESCO, on behalf of UN-Water. It stresses the urgent need to change the way we use and manage this vital resource, as the United Nations prepares to adopt new Sustainable Development Goals. The Union Minister of Women and Child Development, Smt. Maneka Sanjay Gandhi has written to the various Chambers of Commerce and Industry including FICCI, CII, ASOCHAM and PHD regarding the constitution of an Internal Complaints Committee at workplace to deal with complaints of sexual harassment. In her letter, the Minister said that the Ministry has been receiving complaints from women working in the private sector about the absence of such a committee in their organizations. Many Members of Parliament have also personally raised their concern on this issue, the Minister said. The Minister has also asked them to furnish the compliance on this issue every month so that the Ministry is able to formulate a strategy towards those entities which do not comply with the provisions of Sexual Harassment of Women at Workplace Act, 2013. Speaking to reporters in New Delhi today, Smt. Maneka Sanjay Gandhi said that she is also writing to the Chief Ministers of States to ensure formation of Internal Complaints Committee in various organizations in the States. The Minister said that the Secretary, Union Ministry of Women and Child Development had written to the Secretaries of Women and Child Development departments of States for setting up such Committees seven months ago, and asked them to furnish report on the action taken. However, no response has been received from the States till date, the Minister added. The Sexual Harassment of Women at Workplace Act, 2013 provides for the constitution of an Internal Complaint Committee by any establishment which has 10 or more employees. This Committee is required to examine the complaints/cases of harassment of women at workplace. The Union Minister of Women and Child Development, Smt Maneka Sanjay Gandhi has said that the Government has introduced a 5-tier monitoring & review mechanism at different levels (National/ State/ District/ Block and Anganwadi level) in order to strengthen the performance of the ICDS. She was replying to supplementaries to a starred question on the working of Anganwadi centres in the Lok Sabha today. The Government has issued guidelines on 31.03.2011 for Constitution of Monitoring and Review Committees at different levels to review progress in implementation of the Integrated Child Development Services (ICDS) Scheme, the Minister said. Composition and key roles of such committees at different levels have been defined and with a view to strengthen and make ICDS more participatory, PRIs and MPs and MLAs have been assigned representation on various committees at State, District and Block level Monitoring Committees, Smt Maneka Sanjay Gandhi explained. Expressing concern at the irregularities in the implementation of ICDS Scheme, the Minister said that the situation is ‘extremely alarming’. She attributed the irregularities to the complete absence of a system of monitoring over the last 40 years of existence of ICDS. Highlighting the problems of the ICDS and Anganwadis, Smt. Maneka Sanjay Gandhi said that there has been no training of Anganwadi workers/supervisors on nutrition related issued. The services of Anganwadi workers have been used for several purposes like electoral work and there are insufficient number Anganwadi centres in the country, she added. Smt Maneka Gandhi explained that out of 12.45 cr children (0-6 years) in the operational Anganwadi centres, 8.42 cr children are availing services under the ICDS. There is also no check on the quality and quantity of food distributed by anganwadi workers, a problem which her Ministry seeks to address, she explained. Giving further details, the Minister said that the Anganwadi workers will be given tablets for real time monitoring of nutrition levels of food, and nutrition laboratories will be set up to test the quality of food being supplied under ICDS. Replying to another supplementary, the WCD Minister said that the community involvement in the system is very important for the success of the ICDS. The Scheme of Sneh Shivirs is being implemented in 200 districts in which a community approach is being followed by forming teams of mothers, Anganwadi and Asha workers etc. She also said that it has been observed that this approach has made a substantial difference to the nutrition levels of the children/pregnant mothers. Replying to a supplementary regarding reduction in Budgetary Allocation to ICDS by 50 percent, the Minister said that she, along with the Health Minister will meet the Finance Minister soon to request for more funds. Meanwhile, she urged the State Governments to commit more funds to the Children’s Schemes since large amount of funds have now been transferred to the states under the new scheme of allocation. Secretary (I&B), Shri Bimal Julka today conferred the 4th National Photography Awards to eminent photographers at a function organized by the Photo Division, under the aegis of the Ministry of Information & Broadcasting at the National Media Centre, New Delhi. The award function was attended by noted cinematographer, Shri Santosh Sivan and Chairman of the Jury Committee, Shri Anil Risal Singh. Speaking on the occasion, Shri Julka said that the National Awards were meant to pay salutations to the greatest and the best from photography profession. The Ministry of I&B and the Photo Division acted as catalyst/ facilitators to create a dynamic environment. The Awards assumed significance as they brought together the most talented and skillful men and women behind the lens and the screen in an assembly to display their artistic expression. Shri Julka also gave an overview of the one day workshop on photography and videography held yesterday and mentioned that the ministry would work proactively to organize similar workshops for the North East and J&K shortly. For this purpose the views of experts at the workshop had been collated and the unanimous view was that the Ministry should facilitate the emerging trends with reference to skill upgradation in these regions. Secretary also mentioned that the Ministry would consider the recommendations of the Jury Committee on suggestions given. Complimenting Shri Patel for the Life Time Achievement Award, Shri Julka stated that the award was being bestowed upon a legendary photographer who had made extensive and excellent contributions in various fields of photography at both the national and international level. Shri Surendra R. Patel was given the Life-Time Achievement Award, Shri Swarup Dutta was awarded the Best Professional Photographer Award and Shri R. Sasikumar was awarded Best Amateur Photographer. Awards were also conferred to 10 winners under the Special Mention category for both, the Professional and Amateur segments. The theme for the Professional Category was “Hamara Bharat Swachh Bharat” and for the Amateur Category is “Mother and Child”. Shri Surendra R. Patel, the winner of the Life Time Achievement Award is an eminent professional in the field of photography. He has participated in several national and international exhibitions and salons from 1951 and has 200 awards to his credit. He has been honoured with several awards and felicitations. He is credited for having presented more than 100 slideshows on Kailash Mansarovar Yatra, 1958 and pictorial photography in different parts of the country. He is an expert in using 120 format film camera, 135 mm film camera and digital camera along-with specialization in dark room photo techniques. He has been on the jury for many photography honors for IIPC, FIP and PSI among others. He has held positions in the capacity of President of India, International Photographic Council, Delhi and former Chairperson of Colour Division Federation of India Photography.